WASHINGTON (Dec. 01, 2011) -- "He knows how I'm feeling. And if I were feeling unwell, which could be any number of things: PTSD, TBI or other type of pain, he would proactively do something to help me." 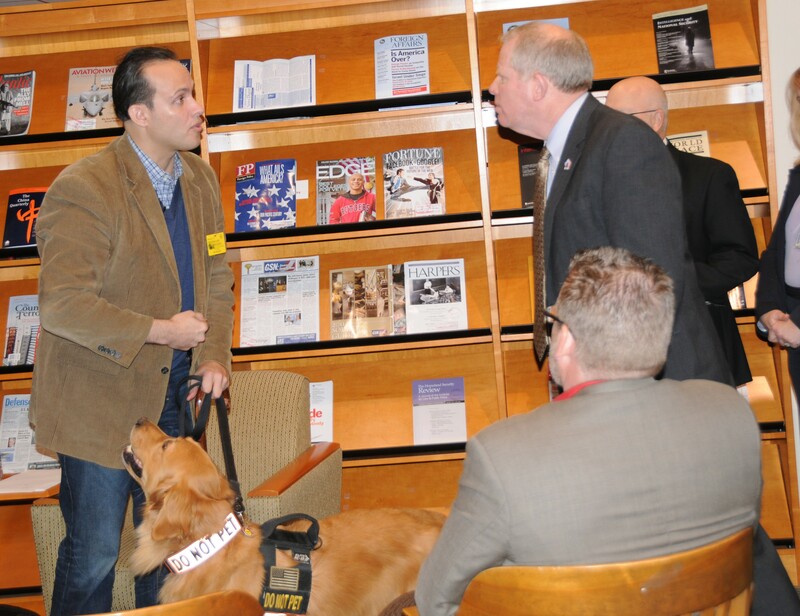 Former Soldier, proponent for sufferers of post-traumatic stress disorder, and author, Luis Carlos Montalván, spoke Nov. 30 at the Pentagon Library about his service dog, "Tuesday." He also spoke about the book he wrote that documents how his struggle with PTSD was aided by "Tuesday." Montalván enlisted in the Army in 1990, first as a communications specialist, then a military police officer, and then an infantryman. He accepted a commission in 2002 as an armor officer, and he served twice in Iraq. "The experiences before, during and after war, particularly those after, were very difficult," Montalván said. "I felt compelled to share what I think so many service members and veterans have gone through ... in the war, and at home, and offer points of light if you will to help and offer hope for many who are struggling." His book, "Until Tuesday" covers the relationship between him and his service dog "Tuesday," who came to him in 2008, after he left the Army. "I was wounded in Iraq in 2003, but the effects of some of those wounds caused me to deteriorate in health over subsequent years and a second tour," Montalván said. "Ultimately, I had to get out of the Army to care for myself and get the help I needed." Tuesday was part of the help he needed, Montalván said. "He helps me with everything from mitigating the effects of PTSD to helping me balance [a result of] traumatic brain injury," Montalván said. "He helps me with mobility when I walk. So physically and psychologically he helps me with my disabilities and is allowing me to move forward in the healing process." Montalván said he believes many don't know what service members endure during their service or after, and he hopes his experiences, which he shares in "Until Tuesday" will enlighten those who choose to read. "There are a lot of service members, as is well known, who are suffering silently, with the wounds of war," he said. "Many who, for fear of coming forward, don't. There are many veterans who have exited the military who are struggling with getting help, struggling with recognizing issues that they have. We really want them and the general society to know the vastness of the problem and details of the problems as well as the light that exists in spite of disabilities, physical and psychological disabilities." In his book, Montalván explains how his service dog "Tuesday" helps him through the ongoing healing process. He said there's hope for all those who have suffered from service-related injuries and PTSD. "You can be happy, you can be employed, you can achieve educational and life goals. You can achieve a happy and successful marriage," he said. "But that will require recognition, that will require treatment, and it will require being committed to a journey of healing, almost for the rest of your life." Montalván said there's been some efforts in how service members can receive care after they leave the military, but he said more needs to be done. "There have been a number of macro movements to help mitigate the colossal and corrosive problems of invisible disabilities and other wounds of war," he said. "But the juggernauts of the DOD and the VA and other institutions are slow and there is a lot more that needs to happen." Today, Montalván lives in New York City, with his service dog, Tuesday, and is in the process of earning a second master's degree in strategic communications at Columbia University, to augment his first masters in journalism.